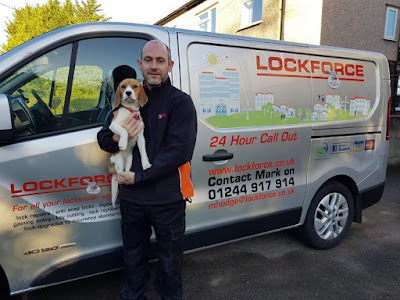 Lockforce Emergency Locksmiths News: Mark Hodge opens the new Lockforce Chester branch! Mark Hodge opens the new Lockforce Chester branch! Here at Lockforce HQ we’re delighted to welcome aboard Mark Hodge as Owner and Manager of Lockforce Locksmiths Chester, along with one of his three beagles! Mark's new branch covers Chester, Wirral and Ellesmere Port. He successfully completed our extensive training programme last week and has already hit the ground running. Mark is not only DBS checked but an Armed Forces Veteran, so you can rest assured your safety is paramount to him!